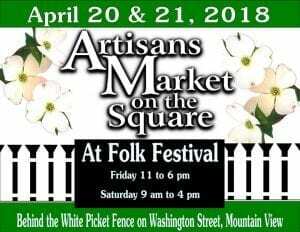 Artisan’s Market on the Square during Folk Festival in Mountain View April 20 and 21 will offer the best of the State’s arts and crafts from juried members and guests of the Arkansas Craft Guild. Photography, flame-worked bead makers with jewelry and glass sculpture, woodworkers and instrument makers, quilts, and fabric décor will be offered for sale. One can browse beeswax products, goat milk soaps, lip balm, and lotions, copper wire jewelry, hand thrown stoneware pottery from about 30 exhibitors. The Market is located on Washington Street next to Mountain View Music. Hours are Friday, April 20, 11 to 6, and Saturday, the 21st, 9 to 4.